Width 31.5", Stowed height: 7' 2". 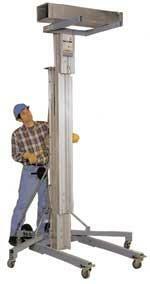 Great for lifting heating or cooling units, garage doors etc. * Please call us for any questions on our 24 foot superlift forked rentals in Calgary, Alberta.